In the recent time, if you don't have a proper record of stock at your restaurant, you are at a major loss. And be prepared to face adverse consequences too. And as the customer demands are widening and restaurant operations are getting more advanced, we often forget to manage inventory and stock properly. Isn't it? But let me tell you, managing your inventory and stock is equally an important part which can lead to the success of your restaurant business. The inventory system in restaurants basically allows the users to control and manage the stock of the restaurant accurately, and further helps in boosting up the overall profit at your restaurant. This lets you stay away from the irrelevant wastage of stock and keeps you updated on the food items which are running out of stock. 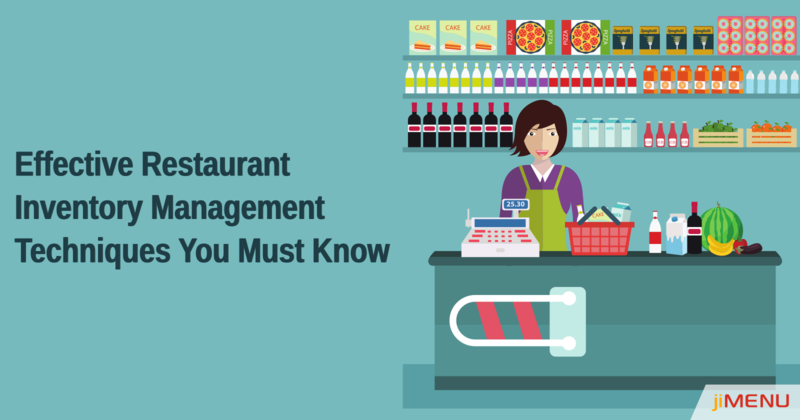 So, it's high time that you ensure that you aren't committing any inventory management mistakes at your restaurant. Monitoring the stock: Before you bring the new stock, you need to analyze the existing amount of stock in the restaurant. Moreover, if the stock used while preparing food is below the variance level, it means the stock is used in less quantity than expected and this will result in falling food quality. Similarly, if the variance level is high, it indicates theft or pilferage. So, there is a need for an automatic inventory system which can accurately manage the stock. Recipe management: Managing recipes accurately help you in curbing food costs. As every particular food item has a specific amount of ingredients required, the inventory management system will automatically detect and keep a record of stock and judge how many days will the stock last for. This will help your staff to save time and efforts while calculating the stock and receive accurate outputs. Kitchen Order Ticket: There are various restaurants which have multiple outlets. Having a centrally managed kitchen where the food is cooked and processed to other outlets. Having an automatic inventory system let you receive their requirements automatically and even manage the stock supplies in multiple stores. Shelf life management: Shelf life management is one of the necessary parts of managing inventory of your restaurant. Simply because every food item has a different shelf life like grains can last for years, while green vegetable gets stale in a day itself. So, due to low sales, if the food items aren't getting used, you will automatically be notified and you can get a clear idea that how much stock to purchase in the future. Sales reports and analysis: The sales report and the raw material usage assists the restaurant staff to get a clear idea of profits and losses you faced in a particular period of time. Depending on these reports, you can easily decide which food items are more in demand and which ones are just not preferred by the customers. Do you have an automated inventory system for your restaurant? If not, its time to look up for a vendor which can cater to all your restaurant needs and take your food business to the next level. jiMenu is one such ideal vendor which offers digital menu POS services at the most affordable prices. Get in touch with us and enjoy our exciting services now. How Restaurant POS Software Has Evolved Over Years? How Digital Menu Systems Have Revoluntionized The Restaurant Industry? Impact Of Replacing Paper Menu With Digital Menu On Your Business! Mistakes To Avoid While Switching To Digital Menus! Making Your Restaurant Menu Attractive and Interesting! jiMenu is the solitary amazing digital menu software that helps you teleport your menu from paper to screen. Run the intuitive menu on your tablet and enable your visitors to have an extremely particular digital menu experience. © 2017-2019 jiWeb Technologies LLP . All Rights Reserved.